Melanger or Urbach maker is designed for making chocolate, peanut butter, Urbach and other sweet and nutritious foods. Presented in this section model belangero suitable for both beginners and professionals: they are easy to manage, and at the same time multifunctional. Power melanger enough for thorough grinding of almost any products, even such strong as flax or Chia. In melanger RawMiD you can prepare mouth-watering chocolate, melting in your mouth peanut butter, perfectly homogeneous in its consistency Urbach and tahini, cream soups, purees, sauces, pastas and many other dishes. Buy melanger for chocolate and nuts in our online store. We have descriptions, reviews, reviews, photos and video of this and other equipment. Buy Urbach maker on our website and get free shipping! Urbach makers line RawMiD combine high engine power, durability of granite millstones, reliability and safety bowl made of stainless steel. Nuts, beans, grains, seeds, cereals are ground to the smallest particle size of 15-20 microns. Melanger suitable for home use and small business for the production of high quality dessert chocolate Urbach, hazelnut spreads. Melanger for commercial use will allow to produce new kinds of products according to a unique recipe. Urbach maker help in the preparation of homemade sweets from natural ingredients. Do not trust the quality of store products? Want to guarantee yourself and your loved ones safety when eating chocolate or peanut butter? Buy melanger for chocolate RawMiD and get an extremely useful and natural products! ► versatility - with the help of melanger RawMiD you can cook various dishes by unique recipes. The kit includes additional attachments for kneading dough and getting shavings of coconut flesh! Melanger suitable for the preparation of chocolate, Urbach, peanut, hazelnut, cashew nut paste, marzipan, hummus, tahini, various sauces and pastes, cream soups and purees, wheat, oats, buckwheat or any other flour. Also with the help of special attachments you can knead the dough and get the shavings of the coconut flesh. Buy melanger for chocolate and nuts with delivery throughout Russia and the CIS on our website. See also we have reviews, reviews, photos and video Urbach makers and other goods for a delicious and nutrition! 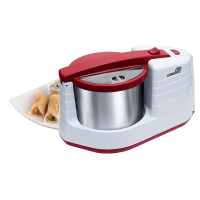 Melangeur for chocolate and Urbach maker Dream Classic is a versatile kitchen appliance, designed for lovers of tasty and healthy food. With it, you can cook mouth-watering chocolate, melting in your mouth peanut butter, orbec with a perfectly homogeneous texture and a lot of other yummy nut..